When War of Attrition, the famous 2006 Cheltenham Gold Cup Winner, suffered a serious foreleg tendon problem in March 2007, an all-out effort was made to aid his recovery and bring him back to compete again in the jump racing world. A new breed of company in the British Isles was tapped to micro-manage the horse's treatment and recovery. "Tendon Works" operates in-patient equine treatment centers--the equivalent of an intensive-care equine clinic crossed with a layup farm. At a center near Canterbury, south of London, England and a new one in Fethard, Ireland, horses undergo ten-week programs of biomechanical and clinical assessment followed by treatment and rehab. “War of Attrition presented with an obvious and significant tendon injury to the right fore superficial digital flexor tendon (SDFT), and early signs of damage to the SDFT on the contra-lateral side,” says Dr David Chapman-Jones of Tendon Works. “Following as assessment on the treadmill, (in my opinion) it was clear his front limb loading and hindquarter action were also not right," he continued. "Russell Guire of Centaur Biomechanics assessed the horse using Equinalysis video-based screening, and the results surprised us all by showing a problem with the horse’s left fore and also a problem in his pelvis. The combination of Equinalysis’ locomotive assessment and Tendon Works’ cell regeneration treatment, which claims to boost the damaged tendon’s electro-chemical signaling process with stem-cell technology, means equine healing and recuperation can be accelerated. 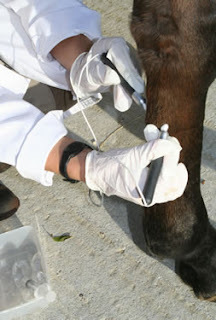 Equinalysis technology records and collates physiological aspects such as a horse’s stride length and joint flexion, providing owners with a baseline of data; the screening is performed by trained clinicians and data is collected using a laptop computer and single or multiple digital cameras. The screening service is available to all horse owners, and is recommended for ‘benchmarking’ a horse to assess its locomotion when sound. Going forward, Tendon Works will be incorporating Equinalysis screening into their injury prevention evaluations at the new Fethard Equine Hospital in County Kildare, Ireland. Please visit: www.equinalysis.co.uk for info about the screening technology, or www.tendonworks.com for details of Tendon Works’ treatment regimen and services. Perhaps no one would notice this but me….BUT…a new promotion for the 2010 FEI World Equestrian Games (to be held at the Kentucky Horse Park, first time outside Europe) is using horseshoes to mark off the years. The promo launched last month, with one year/horseshoe crossed off, while three years/horseshoes remain. Their choice of horseshoe style intrigued me. I don’t think that St. Croix/Mustad or Diamond is a sponsor (yet) but there is a lineup of one or the other company’s basic toe-and-heeled shoe. I had to chuckle because it is not likely that a single horse in the World Equestrian Games would be shod with that shoe. Meanwhile, the hilly country of Kentucky is surely home to a lot of trail/pleasure horses that would be wearing those shoes. The farrier world missed a great opportunity here. The shoes chosen for the graphic could have been the specialized shoes you’d see on eventing, jumping, endurance and reining horses that will be competing at WEG in 2010. Not to mention driving, dressage, and vaulting shoes (if there is a vaulting shoe!). Although, by 2010, who knows what types of shoes the sport horses will be wearing—or if they might all be barefoot or booted or laminated or glazed! 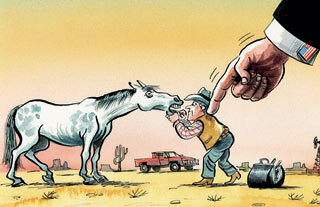 This week's issue of the prestigious British newsmagazine The Economist looks askance at the controversy in Texas, where veterinarians are supposed to be taking over tooth-floating of horses. The Brits think this action is downright unAmerican and take a look at the ethics of licensing or changing the playing fields of previously unregulated trades and professions. While Britain is highly regulated, they tend to think of America as the land of free enterprise. Come to think of it, so do a lot of Americans. This article is worth reading, no matter where you stand on the various campaigns for veterinarians to take over responsibility for all aspects of animal care, from tooth floating of horses in Texas to clipping of dog claws in California. There was always a “PS” to the Barbaro story last year. At the same time that Barbaro was winning the Kentucky Derby, his stablemate from the 2003 crop of foals bred by Roy and Gretchen Jackson’s Lael Stables was excelling in Europe. “George Washington” went on to dominate the three-year-old ranks in England and Ireland. His success must have been some small consolation to Mr. And Mrs. Jackson as they struggled with Barbaro’s surgery, convalescence and eventual tragic death when laminitis overwhelmed his recovery odds. This spring, the Jacksons’ Kentucky Derby winner was euthanized, never having sired a foal. And in Ireland, their other star product was a dud as a stud. Undaunted, the Irish connections sent GW back to the track, where he had a modicum of success in a 2007 comeback career. At least he didn’t embarrass them too badly. His trainer, the ever-successful Aidan O’Brien of Ballydoyle, shipped GW to Monmouth last week to enter the Breeders Cup Classic, a race he had failed to win in 2006. Just as the horses were preparing to enter the gate, the ESPN commentator gave a quick insight into GW’s connection to the Jacksons and Barbaro. Was it a human interest quip or a curse? The screens went up, the horse ambulance arrived. People ran up the track. Who are those people? I realized I had been holding my breath through seven races, breathing a half-sigh of relief when all the horses cantered across the finish line, no matter how far up the track. They all finished, at least in the races I saw. And then, in the last race, the one horse with an eerie connection to the world’s most famous breakdown met his end. It was not a Hollywood ending; it was more of Greek tragedy. We know how it ends. But we keep watching. ERIC WING: We are live in the interview tent right now. We have with us Dr. C. Wayne McIlwraith, the (designated) On-Call veterinarian of the American Association of Equine Practitioners. We saw George Washington was eased late in the race. Can you give us an update on what is going on with George Washington? DR. McILWRAITH: George Washington sustained an open fracture of the cannon bone in the right front fetlock joint and disarticulated the joint at the same time and had both sesamoid fractures broken. So it was a hopeless injury as far as repair, and he has been euthanized. ERIC WING: Is this anything that can be attributed to a sloppy racetrack or not? DR. McILWRAITH: No. You know, there's been no comparative work done scientifically as far as the nature of the track. You know, at times, a sloppy racetrack at the end of the day, you could have some concerns, because they are running in the base; and then obviously the base is not made for them to be running on directly; like it was a very sloppy track. You know..the rest of the races have gone off well, but it's always a concern. Q. It looked, watching the race, as a spectator, that George Washington was maybe having a little trouble negotiating the course early on. He seemed to be struggling, at least relative to the other horses. Is there any knowledge whatsoever about when during the course of the race this injury might have occurred? DR. McILWRAITH: Well, typically these injuries occur in the last part of the race. They are more fatigued so they have got less support to the joint. And that's when the injuries normally occur. As you know, he's -- I think this is the first time he's raced on a dirt surface. And he could have had trouble with being less coordinated on that, as he's used to racing on grass; those are possibilities. (continues)We generally consider these fractures to start as associated with earlier damage, so they can sustain a small degree of damage and then it can escalate into a fracture. So it is quite possible, especially when you have a horse that's relatively inexperienced at that surface and racing on a different surface. We talk a lot now about investigating the cause of these fractures, minor incoordination or just not landing on the leg as exactly the same way as a horse that's completely used to that surface does. ERIC WING: Were any of the three owners or trainer involved in the decision prior to euthanization, or is it an open-and-shut case, pardon the term. DR. McILWRAITH: The decision was made very quickly. Aidan O'Brien was on the racetrack with the horse right after it happened and he requested euthanasia. Q. I wish to point out, George Washington raced in the Classic at Churchill last year, but races on grass and switches to a track with a lot of water and slop, does it have any meaning, meaning is this a bad example? DR. McILWRAITH: You mean a bad example to switch it to a sloppy track? Q. Are you saying it's not a wise move that it should be or should not be done? DR. McILWRAITH: No. I was being asked for sort of possibilities as to, if you can have contributing factors, and you can certainly have many contributing factors. But, no, I certainly did not imply that it's not a wise move. ERIC WING: I don't mean to take you outside your field of expertise or your focus today, but as an onlooker and an observer, can you characterize in any way the emotions of Aiden O'Brien or the owners from where you stood? DR. McILWRAITH: Well, we weren't there. (Dr. Bramlage) and I, we were across the racetrack. So we have no -- we weren't present for that. But I'm sure he's extremely upset about it. ERIC WING: Doctor, as always, we appreciate your expertise and your speed in getting in here and updating us on the situation. Thank you very much. New York may soon have one of the toughest laws in the United States on the levels of steroids allowable in racehorses. The rule was unveiled at a meeting of the state racing board yesterday. The members of the New York State Racing and Wagering Board are interested in receiving industry comments and positions for their proposed rule change. A rule in its conceptual form is posted on the Internet for your review. Should you wish to comment, kindly email your responses to vdavis@racing.state.ny.us, or mail to Racing and Wagering Board, 1 Broadway Center, Suite 600, Schenectady, NY 12305-2553. Note: It's not clear how or if this rule would affect horses presented in sales. Click here to read the entire proposed rule. Ramona, California is just one of the towns affected by the raging fires in southern California. The database of Hoofcare & Lameness Magazine shows that there are 13 farriers and 3 equine practitioners who live in that one usually horse-happy town; we have 34 subscribers that I can identify as living in urban San Diego. One-quarter of our subscribers live in the state of California. The American Farrier's Association has an update on their web site with news from a few of their members who live in the area. National Geographic has a nice slide show of human evacuees and their animals. The photo in this post is part of that show. Tonight I spoke with Mark Silverman DVM of San Dieguito Equine Practice; he described the scene at Del Mar racetrack as "amazing" both in terms of the volunteer spirit and the outpouring of support and supplies available to the horses encamped there--and their owners. He was treating a few minor injuries and respiratory problems but said the horses were in good shape, overall. A week from now, Dr Silverman will be in West Palm Beach, Florida to speak at the Fourth International Equine Conference on Laminitis and Diseases of the Foot. This just in from our enthusiastic friend in Europe; CESMAS is a fantastic meeting and, as usually, will have a unique flair. I highly recommend these meetings (and their proceedings books; each conference has a theme and the book is a treasure). Directors for the course include Hoofcare and Lameness consulting editors Hilary Clayton, Jean-Marie Denoix, and Sue Dyson. Besides writing hello this message suits the purpose of drawing your attention to the next CESMAS – Conference on Equine Sports Medicine and Science – that will take place on July 10 - 12, 2008 with seminars on July 9 and practical courses on July 13 in Utrecht, Netherlands! This time we will visit the home of Marianne Sloet Baroness van Oldruitenborgh-Oosterbaan! The focus of the keynote lectures is the poorly performing sport horse, and even more focused: “Diagnosis and treatment of the poorly performing sport horse – within 14 days of an important competition”. We have rented a theatre in downtown Utrecht for your comfort and enjoyment. Most keynote lectures will be presented by two speakers called “actors” in a straight forward manner aiming at involving you as much as possible. • Could it have a cardiovascular cause? If yes: What can be done? Rivero and a partner not committed yet. And more to come!! Thus you see, the instructors are very good and will have enough time to show all their expertise in sort of theatre plays!! The final programme will be announced in March 2008 and mailed late March to early April 2008 to you! Please check www.cesmas.info to keep updated! And please pass on the information to others that may be interested too! The nearest airport is Schiphol, Amsterdam: www.schiphol.nl (30 to 45 minutes to Utrecht depending on the train schedule). • Acceptance is based on the completeness and practical relevance of the work. • Accepted work may be published in the book “Diagnosis and treatment of the poorly performing sport horse – CESMAS 2008” (available during the conference). • Each abstract will be reviewed by several independent referees. Prior to review, the names of authors and affiliations are removed to ensure unbiased review. • Work will be accepted based on abstract score and availability of time slots in the programme. We look forward to receive your work! Wish you health and fun! LEXINGTON, Ky— Lexington's Rood and Riddle Equine Hospital will be the Official Equine Hospital and Veterinary Partner for the 2010 Alltech FEI World Equestrian Games, as announced today by the World Games 2010 Foundation, Inc.
“We are well prepared as a hospital to meet the variety of veterinary services that these World Championship horses may need leading up to and during the 2010 Games,” said Dr. Bill Rood, Hospital Director. Rood & Riddle is a full-service equine hospital. Spread over several acres, the hospital was established in 1986 as a referral center for horses requiring specialized medical and surgical care. Today Rood & Riddle is known and respected throughout the world for its innovative and highly skilled treatment of horses. The hospital facility offers a full range of services including surgery, internal medicine, advanced diagnostic imaging, a focused Podiatry Center and a specialized Reproductive Center. “While we certainly hope that no horse will need emergency services during the Games, it is only fitting that an equine hospital with such an outstanding reputation—and a nearby location—is able to sign on as our veterinary partner," said World Games 2010 Foundation CEO Jack Kelly. The Alltech FEI World Equestrian Games, to be held at the Kentucky Horse Park September 25 to October 10, 2010, are the world championships of the eight equestrian disciplines recognized by the Fédération Equestre Internationale (FEI), and are held every four years. The Games have never before been held outside of Europe; nor have all eight disciplines ever previously been held together at a single site. It is anticipated that more than 600,000 spectators will attend the 16-day competition. Course title: Horse biomechanics: what is in it for farriers? This afternoon session is aimed at farriers who would like to know what is going on in equine biomechanics research and how this could be useful for their daily work. An introductory session in the lecture theatre will give an overview horse related biomechanics research. This will be followed by practical demonstrations in the Structure and Motion Lab. Biomimetics Update: Would tree frogs stick to horse hooves? Biomimetics is in the news again. The word that is kind of fun to say means "taking design ideas from nature" or mimicking things that we see work well in the natural world. The latest hotspot in the product design world is the foot of high-climbing tree frogs, or geckos and other lizards that seems to defy gravity. If you've ever spent a lazy siesta in Mexico watching the lizards scale sun-scorched walls, you too may have marveled, "how the heck can they do that?" A scientist named Jon Barnes at the University of Glasgow in Scotland has made a career out of studying tiny tree frogs and how they move about. Tree frogs and cricket toes contain microscopic channel patterns that prevent cracking. If an adhesive could avoid cracking, it would be reuseable. Scientists at the Indian Institute of Technology have cracked the code and a new generation of adhesives called "Geckel Glue" will be announced in tomorrow's issue of the journal Science. The glue is made of gecko hairs and mussel protein fibers. Researchers found they could increase the adhesive strength by partially filling the microchannels with fluid. The surface tension of the liquid creates a capillary effect—the ability of one substance to draw another toward it like a sponge soaking up water. Geckos have hair? Apparently, yes, there are microscopic, spatula-tipped hairs on gecko feet. And you don't have to convince me that mussels have something special going on; no matter how hard the waves crash on the rocks around here, the mussels never budge. And best of all, mussels cling even when submerged, and the new Geckel glue is supposed to excel in moist environments. A new design of tire tread that biomimics tree frog feet is also in development. Maybe some plastic shoe designer is reading this...tree frog toe pads might come in handy when a horse has to climb a trail like in the Tevis Cup endurance ride in California. Maybe Geckel Glue will even hold a shoe on...or at least put the cup holder in my car back together...but can anyone tell me the biomimetic origin of "Gorilla" Glue? Photo links to National Geographic article on gecko and mussel adhesion. Not trample, exactly, but they are sure to give it a good stomp with those Scotch bottom shoes. Yesterday was the start of the World Clydesdale Show at the Alliant Center in Madison, Wisconsin. This is the first time the show has been held in the USA. I was quite taken with this photo of one of the Budweiser Clydesdales from Thursday's Capitol Times. Sadly, the show has already been scarred by the tragic deaths of four members of a showing family who had camped in a horse trailer to be near their horses and died of carbon monoxide poisoning caused by an unventilated space heater. The legendary Thoroughbred racehorse John Henry was euthanized at the Kentucky Horse Park today at 7:00 pm, just an hour ago. The sad but unanimous decision was reached by a team of people who knew him best. The park’s equine director, Kathy Hopkins stated, “After continued successful efforts to maintain the quality of John Henry's life, in the past 48 hours he did not respond to our medical intervention. Due to the loss of kidney function and muscle mass, his veterinarian, Dr. Mike Beyer, found it impossible to keep him properly hydrated and comfortable. He lived 32-and-a-half years, and went peacefully to sleep surrounded by a small circle of friends who were closest to him, including his breeder, Verna Lehmann and Cathy Roby, who has been friend and caretaker to the great gelding for 16 years. John Henry overcame numerous well-known obstacles throughout his career, and colic surgery in 2002. His talent, determination, tenacity and toughness inspired thousands of people who didn’t even see him race, but became aware of him many years after his retirement. Some of his fans visited him at least once a month from Toledo, Indianapolis, and other cities in the Midwest, while others made annual pilgrimages to his barn from California, Texas and around the world. John Henry’s race record included more than $6.5 million in earnings, 39 wins including 30 stakes wins (16 Grade 1 stakes wins) and seven Eclipse Awards, including two Horse of the Year titles. He was the only horse to win Horse of the Year more than once in nonconsecutive years, and the oldest horse ever to win that title - at age nine. John Henry was voted Racehorse of the Decade for the 1980s, and was inducted into Racing's Hall of Fame in 1990. After having passed through several owners and trainers, John Henry finally blossomed under the careful tutelage of trainer Ron McAnally, and with his owner, Sam Rubin. McAnally, who brought out the best in the horse with “carrots, apples and love,” visited John Henry many times during the horse’s retirement and had just seen him again as recently as September. Lewis Cenicola, John Henry’s exercise rider for six years, also visited the horse in September. John Henry will be buried near his paddock at the Hall of Champions. Other Thoroughbred champions buried at the park include Man o’ War, War Admiral, Forego, Bold Forbes, Allez France, Peteski and Jay Trump. Thanks to the Kentucky Horse Park for their prompt announcement. What was first dismissed as the same old "Germans vs Dutch" arguments at the top of the dressage competitor legions segued into an argument of classical vs "modern" dressage. An FEI special forum on the subject, aided by presentations by Hoofcare and Lameness consulting editors Jean-Marie Denoix of France and Hilary Clayton of the USA was inconclusive. The photo at the top of this page is posted on the web site of our friend Andreas Hausberger, a bereiter with the Spanish Riding School of Vienna who frequently gives clinics in the USA. The black squares over the rider's face are my addition. This debate just won't quit; recently the Dutch trainer Coby Van Balen was secretly photographed overseeing a lunging session in which the overflexion or "bite the chest" frame seems to be imposed on the horse. The spy photos have been posted freely across the Internet and the reputation of one of the world's top trainers is being smeared. I won't even begin to compare the European furor with everyday practices of show horses in the USA. You all know the scene over here, but the Europeans and the horse welfare scene in Europe exist in a separate reality and you can't just dismiss this. Dutch national team farrier Rob Renirie will present a special half-day workshop on sport horses at the Laminitis Conference in Palm Beach next month; it will be intersting to hear his take on rollkur; he is the personal farrier to Anky Van Grusvnen and sees it all. Adding more fuel to the flames is the publication of a book that will be sold through Hoofcare and Lameness Bookshop...though I wish I had a book from the other side, as well. "Tug Of War: Classical Versus Modern Dressage" is thoughtfully written and beautifully illustrated by German veterinarian Gerd Heuschmann. It's one of the best treatises I have seen on functional anatomy of the dressage horse and I hope it outlives the rollkur debate! In a detailed yet comprehensible fashion, Dr. Heuschmann describes parts of the horse’s body that need to be correctly developed by the dressage rider. He then examines how they function both individually and within an anatomical system, and how various schooling techniques affect these parts for the good, or for the bad. Using vivid color illustrations of the horse’s skeletal system, ligaments, and musculature, in addition to comparative photos depicting “correct” versus “incorrect” movement—and most importantly, photos of damaging schooling methods—Dr. Heuschmann convincingly argues that the horse’’s body tells us whether our riding is truly gymnasticizing and “building the horse up, ” or simply wearing it down and tearing it apart. DR. GERD HEUSCHMANN trained as a Bereiter (master rider) in Germany before qualifying for veterinary study at Munich University. There he specialized in equine orthopedics for two years before accepting a post as the head of the breeding department at the German FN, which he eventually left to start his own practice in Warendorf. He has been an active member of the “hyperflexion” (previously referred to as Rollkur) debate, weighing in at the 2005 USDF National Symposium and the 2006 FEI Veterinary and Dressage Committees’ Workshop. 144 pp • 6 ½ x 9 • 76 color and 5 b/w photos, 20 color illustrations • $25 plus $5 postage in USA; $12 postage outside USA. Click here for our printable/faxable order form or call 978 281 3222 to order; email orders to tugofwarbook@hoofcare.com. 1. Farriers who service race horses on a race course are not to service any other horse off that race course. 2. Farriers who shoe off a race course are not to service any race course. 4. Farriers who shoe race horses are not to shoe pleasure horses. These directives will remain indefinitely until further notice; legal action will be taken if these directives are not adhered to. A new outbreak in a former "green" (uninfected) zone near the border between New South Wales and Victoria ups the risk of the disease spreading into the southern state, which is holding its breath with one of the world's greatest stakes races, the Melbourne Cup, coming up in early November. Equitana in Victoria has been cancelled for next month and the Royal Melbourne Show went on without a horse show last month. "Let's Help Free the Horse of Laminitis"
About the Animal Health Foundation Mission: The Animal Health Foundation is a not-for-profit, all-volunteer organization dedicated to the study of Equine Laminitis (founder). Finding the cause and developing a prevention of Laminitis has been the goal of the Animal Health Foundation since 1984. The Animal Health Foundation has been supporting Dr. Pollitt's research since 1995, as well as the research of innovative experts like Kathryn Watts of www.Safergrass.org. Note: The AHF is Dr. Pollitt's sole source of research support from the USA. He is coming to America with great new research findings that should lead to new advances in preventing and treating laminitis. Many of his new findings have been made possible by financial support provided by small and large donations from individuals received through the AHF. Donations to the AHF go directly to laminitis research. "Our heartfelt well wishes go out to the Australian equine community during this trying time. In order to help our fellow farriers and Australian members during this time, the AFA's Board of Directors has voted to waive registration fees for up to twenty Australian farriers choosing to attend the AFA's 2008 Annual Convention in Lexington, KY."
For more information about the American Farrier's Association, call (859) 233-7411, or go to www.NoFootNoHorse.org on the Internet. Did You Know: A Farrier Bred and Raised the Legendary Racehorse "Refrigerator"
Recent news from the American Quarter Horse Association piqued my interest in a runner named Refrigerator. He was the first Quarter horse to break the $2 million earnings ceiling and his owners recently set up a fund in his memory to raise money for traumatic head injuries in horses. I'm not sure exactly how the gelding died, but apparently it was some sort of an accident. Trying to find out how he died led me to one of my journalist colleagues. Sally Harrison covers the western performance scene the same way I cover the hoof scene, and I knew she would have the scoop on Refrigerator. Little did I know what I had stumbled upon! It turns out that this icon of Quarter horse racing was bred and raised by farrier Sonny Vaughn of Oklahoma. He bartered his farrier services for the stud fee. Sally has resurrected some of her archive on Sonny and Refrigerator and created a new Refrigerator post on her excellent blog so that the farrier angle on the new AQHA fund could be known, once and for all.